Pineapples are a funny-looking fruit with a serious impact on health, and their health and medicinal benefits include their ability to improve respiratory health, cure coughs and colds, improve digestion, help you lose weight, strengthen bones, improve oral health, boost eye health, reduce inflammation, prevent cancer, increase heart health, fight off infections and parasites, improve the immune system, and increase circulation. Pineapple is a very nutritious fruit that looks like a pinecone. It has a sweet taste. Since the fruit is rich in nutrients, it is very good for health. The fruit is available in the market the whole year. It has nutrients that help in digesting food. Pineapple is a rich source of carbohydrate, vitamins, calcium and minerals. There is very less protein in it. Pineapple contains bromelain enzyme, which helps in curing many diseases. It contains antioxidants, which fight free radicals. The fruit has anti-inflammatory properties. It is useful for treating gout, atherosclerosis, catarrh, nausea and intestinal worms. Pineapple is very good for nails also. It can heal cracked feet and chapped lips. We will tell you about some other benefits of this fruit. Pineapples are a delicious tropical fruit that have been celebrated for centuries not only for their distinct and unique taste, but also for their seemingly miraculous health benefits. Pineapples are eaten fresh, juiced, cooked, and preserved and their leaves are even used for wallpaper and ceiling insulation. They belong to the Bromeliaceae family and are actual a composite fruit made of coalesced berries that grow at the crown of a fruiting tree. 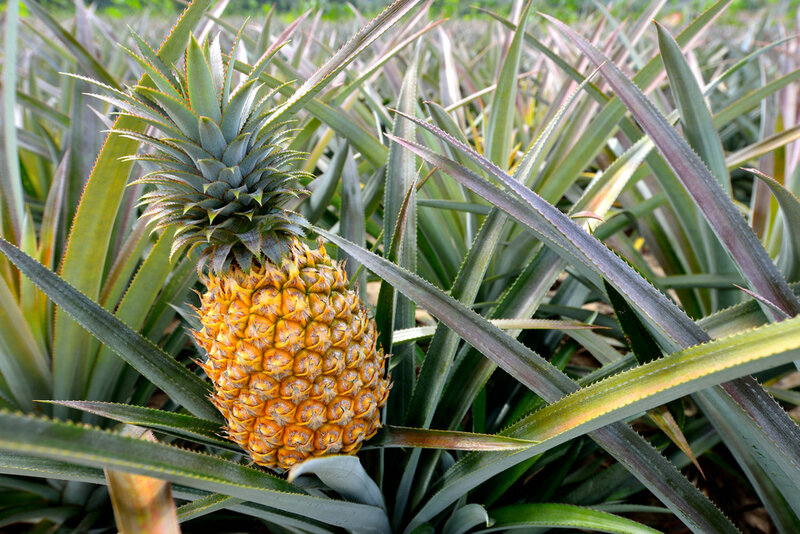 Historically, the most significant grower of pineapples was Hawaii, but they are now cultivated in large quantities in Brazil, the Philippines, and Costa Rica. That being said, the fruit is actually native to Paraguay and Brazil, and possibly parts of the Caribbean. The exact movement of pineapples and the evolution of pineapples as a popular global fruit are still somewhat unknown. It was first brought to Europe and Spain following Christopher Columbus’s return there in 1493. Its fruiting season run from March until June, and each tree can produce a number of fruits. The name pineapple actually evolved in the 17th century due to its similar structure and appearance to pine cones. Traditionally, they were known as “ananas”. The fruit itself is up to a foot long and is surrounded by thorny spikes, topped with hard, waxy leaves, sometimes up to thirty per fruit. Pineapples and their sweet juice are used and enjoyed around the world, even as a popular flavor in alcoholic drinks, the most famous of which is the tropical drink, the pina colada! 1. Arthritis Management: One of the most celebrated uses of pineapple in terms of health is its ability to reduce the inflammation of joints and muscles, particularly those associated with arthritis, a truly debilitating disease that affects millions of people around the world. Pineapples contain a relatively rare proteolytic enzyme called bromelain, which is primarily associated with breaking down complex proteins, but it also has serious anti-inflammatory effects, and has been positively correlated with reducing the signs and symptoms of arthritis in many test subjects. 2. Immune System: A single serving of pineapple has more than 130% of the daily requirement of vitamin-C for human beings, making it one of the richest and most delicious sources of ascorbic acid. Vitamin C is mainly associated with reducing illness and boosting the immune system by stimulating the activity of white blood cells and acting as an antioxidant to defend against the harmful effects of free radicals. Free radicals are dangerous byproducts of cellular metabolism that can damage various organ systems and disrupt function, as well as cause healthy cells to mutate into cancerous ones. The vitamin C content of pineapples defends against this. 3. Tissue and Cellular Health: One of the commonly overlooked benefits of vitamin C is its essential role in creating collagen. This is partly the reason why it is seen as a healing vitamin, because collagen is the essential protein base of blood vessel walls, skin, organs, and bones. High vitamin C content helps you heal wounds and injuries to the body quickly, along with defending against infections and illness. 4. Cancer Prevention: In addition to the antioxidant potential of vitamin C in the battle against cancer, pineapples are also rich in various other antioxidants, including vitamin A, beta carotene, bromelain, various flavonoid compounds, and high levels of manganese, which is an important co-factor of superoxide dismutase, an extremely potent free radical scavenger that has been associated with a number of different cancers. Pineapple has directly been related to preventing cancers of the mouth, throat, and breast. 7. Bone Health: Although pineapples are not famous for having a strong calcium content, which most people immediately associate with bone health, it does have an impressive amount of manganese, which is another trace mineral that is essential in the strengthening of bones, as well as their growth and repair. Manganese is the most prominent mineral in pineapple, and a single serving can deliver more than 70% of your daily requirement of this essential mineral. 8. Oral Health: Along with the antioxidant compounds that protect against oral cancer, pineapples also have astringent properties, which strengthen gums and make sure that your teeth do not become loose. Astringent agents help to tighten up tissues and tone the body so things like tooth loss, hair loss, and muscle weakness or skin loosening does not occur. Pineapples are very powerful astringents and are often prescribed as a natural remedy to fix loosening of teeth or the the retraction of the gums. 9. Eye Health: Vision is one of the most important senses for human beings, and pineapples have been directly connected to boosting eye health and preventing the age-related deficiencies that so often occur. Macular degeneration affects many elderly people, and beta carotene can help to delay this vision problem. Keeping proper amounts of beta-carotene in your diet from fruits and vegetables is essential if you want to properly see the world well into your old age. 10. Blood Pressure: Pineapples are a valuable source of many minerals, and potassium is among them. This is one of the most important minerals in our body, and potassium deficiency can result in a wide array of health hazards. One of the most important functions of potassium is as a vasodilator, meaning that it eases the tension and stress of the blood vessels and promotes blood circulation to various parts of the body. When your blood vessels relax, your blood pressure is reduced and the flow of blood is less restricted. This can prevent clots from blocking the flow of blood and reduces the accumulation of plaque in the arteries and vessels. This helps people prevent conditions like atherosclerosis, heart attacks, and strokes. So eat your pineapples for a healthy heart! 11. Blood Circulation: In a related benefit to the vasodilating potential of potassium, pineapples also provide the body with copper, another essential mineral that functions in a number of enzymatic reactions and compounds in the body. Most notably, copper is a necessary element for the formation of healthy red blood cells. High red blood cell count increases oxygenation to the various organ systems and makes them function at optimal levels. It also increases cognitive abilities and can maintain neural pathways to prevent neural disorders like dementia and Alzheimer’s disease! 12. Pineapple juice is packed with vitamins and minerals. Pineapple contains vitamin C, B-Complex (folate, thiamine, pyridoxine, riboflavin). On minerals front, it is having potassium, calcium, phosphorous and Manganese. It is also rich in natural soluble and insoluble fibre and low in calories. Fresh pineapple juice is having 75 percent of vitamin C of daily requirements. Vitamin C is good for healthy immune system, effective in cold and cell growth. Vitamin B boosts metabolic activities of the body. B6 regulate blood sugar. Vitamin A maintains healthy mucus membrane, eyesight and skin. Potassium prevents muscle cramps and soreness. 13. Pineapple Reduces the Risk of Hypertension. Pineapple juice reduces hypertension due to adequate presence of potassium and lesser amount of sodium. This proportion of potassium and sodium is the best way to combat high blood pressure. A cup of pineapple juice contains about 1 milligram of sodium and 195 milligram of potassium. So, it is suggested that persons suffering from hypertension may take pineapple juice regularly. Pineapple is considered as the fruit which has among the lowest amount of sodium in fruits. 14. Pineapple Good for Heart Health. Pineapple juice improves blood circulation, good for heart health and ensures smooth blood flow in the circulatory system. Pineapple juice also contains bromelain that makes blood thinner which reduces the chances of heart attack, stroke and other heart diseases. Antioxidants in vitamin C also lower the risks of heart diseases by combating free radicals. Vitamin C also prevents atherosclerosis. It acts like as anti-coagulant. 15. Pineapple good for Intestine Health. Eating fibrous foods helps in improving the health of intestine. Since pineapple contains high amounts of fiber, it can make the intestine healthy and disease free. It contains bromelain enzyme, which helps in digesting food. 16. Pineapple Good for Bleeding Disorders. Pineapple is rich in nutrients with anti-coagulant properties. Therefore, the fruit is very useful for treating bleeding disorders. The fruit can stop the formation of blood clots. You can prevent and treat blood clotting by including pineapple in your diet. 17. Pineapple Good for Healthy Hair. Pineapple can make the hair healthy and disease free. It contains Vitamin C, which helps in reversing the problem of hair fall. Eating the fruit helps in faster growth of hair and preventing many types of hair problems and scalp infection. You can get thick and strong hair by eating pineapple. A Few Words of Warning: The benefits of eating pineapple are clear from the impressive list of qualities that you just read, but there is always something about foods that should be cautioned against, and pineapples are no exception. The bromelain in pineapples is primarily a meat-tenderizing enzyme, which is why it is so helpful in the digestion of tough foods. This can result in the softening or tenderness of your “meat” as well, meaning that your lips, gums, and tongue might experience some tenderness or sensitivity if you eat too much pineapple. Bromelain is a powerful chemical, as is vitamin C, if taken in excess. Both of these are in high proportions in pineapple, and an “overdose” can lead to vomiting, nausea, diarrhea, headaches, and nausea. Also, bromelain has been known to stimulate menstruation, so pregnant women should avoid excessive pineapple, as the high levels of bromelain can actually lead to a miscarriage in rare cases. Other than those health concerns, grab one of these spiky tropical fruits and dig in. Your body will thank you for it!